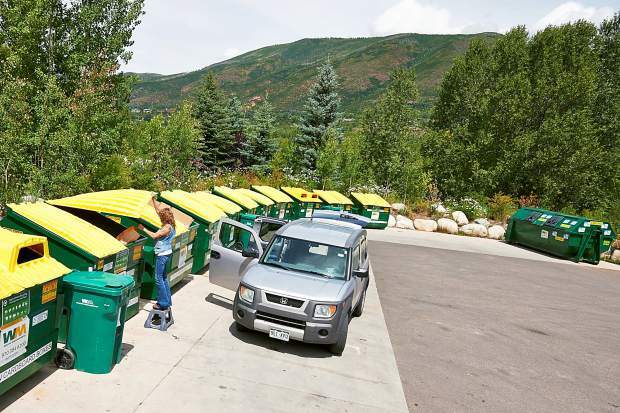 Pitkin County officials are considering going to mandatory curbside pickup for recyclables and doing away with funding for the Rio Grande Recycling Center in Aspen. More than 200 individuals have weighed in both online and in person with city officials at the recycling center and other locales around town, said Liz O’Connell Chapman, the city senior environmental health specialist. “Before we go around spending money, we want to ask taxpayers what they think,” she said. The city must figure out how to fund the recycling center sometime this year; Pitkin County has been paying the bulk of operation but will no longer come August. That’s because the county is now requiring all residents within its jurisdiction to pay for curb-side recycling. The city has required haulers to have curb-side recycling services since 2005, but for unknown reasons it hasn’t been used as much as officials thought it would. Last year, it cost the county $250,000 to have Waste Management haul recyclables from the Rio Grande center. O’Connell Chapman said after speaking with the two haulers that the city could contract with in the future for the same service, it became clear that cost could go as high as $350,000 annually. A less expensive option that is popular with many users who have taken the city’s survey on http://www.aspencommunity voice.com is going to target recycling in which specific recyclables are collected separately. Currently, the Rio Grande center operates as a single-stream collector where plastic, paper, metal and other materials are combined. It’s also the most expensive option, O’Connell Chapman noted. Between 150 and 200 people use the center every day, and over a four-year stretch, just over 4,000 tons of material have been diverted from the local landfill. The city has a 29 percent diversion rate, 2 percent of which is composting. The state of Colorado has an 11 percent diversion rate for recyclables going into the landfills. The city is in the middle of its public outreach campaign to get feedback, which will shape officials’ recommendations to Aspen City Council on how to move forward. The city is asking people to take the survey online, which asks 10 questions about their opinions on recycling and requests additional comments. Also on the website is a community forum for people to make comments in a public setting. Although only eight people have weighed in, they are in favor of the recycling center staying. Another supporter wrote that it is money well spent. O’Connell Chapman said the city will take comments until the end of the month and the best way to do that is on http://www.aspencommunityvoice.com. There are several documents and other informational items available there for people to look at to help them craft an informed opinion. City staff also will be on site at the recycling center from 11 a.m. to 1 p.m. today to answer questions.